Lotta Fritzdorf and Johan Rosenlind began their professional writing career quite late in life. In short time, their authorship now spans from writing for television, thrilling novels as well as cookbooks. Johan Rosenlind has created and written scripts for the TV-series The Restaurant (Vår tid är nu) after an original idea by Johan. Produced by Swedish Television, Jarowskij, Viaplay and Film in Väst. Premier in SVT channel one October 2017. A second season is being produced 2017 and a third is in writing. The Restaurant follows the Löwander family, who runs one of the most prestigious restaurants, Djurgårdskällaren, in the heart of Stockholm. The Second World War is finally over, creating great opportunities as well as entailing conflicts between the old and the new. 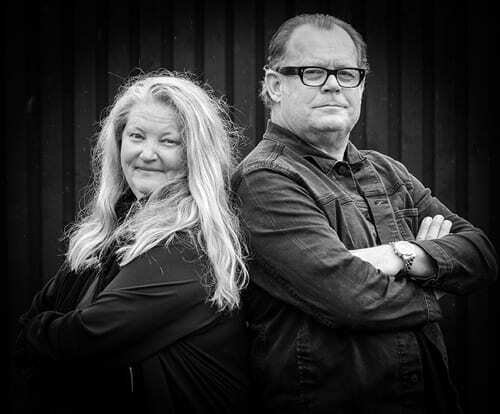 Together, Lotta and Johan are making a cookbook with recipes and food from the TV-series The Restaurant with the aim of capturing the atmosphere of the time, the people and the food at restaurant Djurgårdskällaren. Johan and Lotta also cooperate with Pegasus Pictures, Iceland (producer for Game of Thrones and Fortitude). They have written a drama thriller for Television for the European market waiting for production and a Sci-Fi thriller storyline is resting, as we speak, with American producers. VÅR TID ÄR NU wins the Swedish TV-prize Kristallen 2018.